Piso Fare Promo 2015: A SALE of two cities! 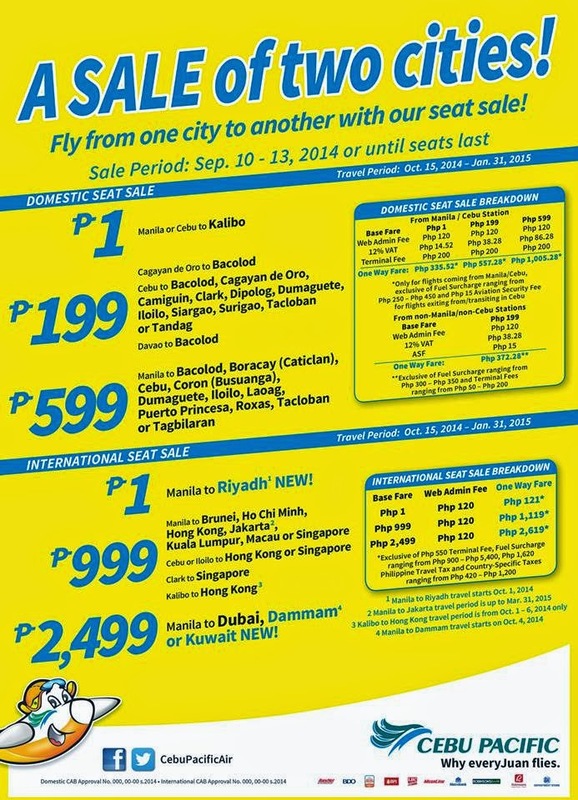 Fly from one city to another with our #CEBseatSale! Start planning your holiday trips and book now at http://bit.ly/CebuPacificAir. Manila to Dubai, Dammam 4 or Kuwait NEW! Manila to Sydney, Australia1 NEW ! Php 900 – Php 5,400, Country Specific Taxes ranging from Php 420 – Php 1,200 and check-in baggage. Promo fares have limited availability and are non-refundable but rebookable subject to the following rebooking fees: Php 1,200 for Domestic destinations and Php 2,000 for Short-haul International destinations and Php 2,500 for Dubai plus fare difference. Please note that booking fee rates range from Php 120 –Php 200 depending on purchase channel. For your convenience, flight changes, availing of prepaid baggage allowance for check-in baggage and web check-in service can be done up to 4-hours before scheduled flight. Is there any promo rates from international to any destinations in the Philippines? Would appreciate updates if any. Cheers! Gd ev pls update me if u have a promo from cebu to pagadian or osamis ds coming december...tnx...im looking forward for ur feedback..
How can I book flight for 4 adults and 1 child? Bale magkano po ung roundtrip ng Cebu or Boracay po sa promo na yan?.. Thank you po..